When you are on the lookout for a party bus in Taylor, then it makes sense that you will want to make certain that the company in question can provide you with everything you need. Here at Rockstarz Limousine and Party Bus, that is what we excel at and when using our services, you can rest assured that everyone will indeed have an amazing time. Your average Taylor party bus rental will mean that you are given access to a bus that will more than likely be sufficient for your needs. However, we believe in going above and beyond that. Not only have we made the maximum use of the space that is available, but we have also added in leather seats to give you somewhere to rest when the party continues on around you. With our Taylor party bus service, you will immediately be transported into your own private nightclub as soon as you board. We have sought to create the best atmosphere ever on our bus and that is helped by the equipment that allows you to be in control of your party as you cruise around town. Whether it be the state of the art stereo system or the laser light show that adds that extra bit of atmosphere, we can guarantee that both you and your guests will love your time spent with us. 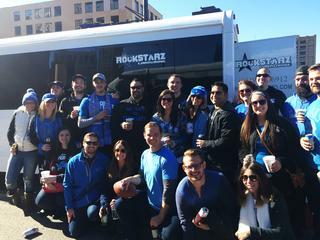 In the past, people have sought to hire our party bus for a number of different kinds of celebrations. From a special birthday, to an anniversary of some description, to a bachelor or bachelorette party. No matter the occasion, we can help, even if you and your friends just feel like having a party in a different setting. So, anybody that resides in the Taylor area and who is seeking a party bus rental should give us a call here at Rockstarz Limousine and Party Bus. Alternatively, you can contact us via our website and someone will be in touch as soon as possible to discuss your needs.